At the Region is an ongoing feature that discusses the state-by-state training, certification and employment requirements of first responder departments across the nation. 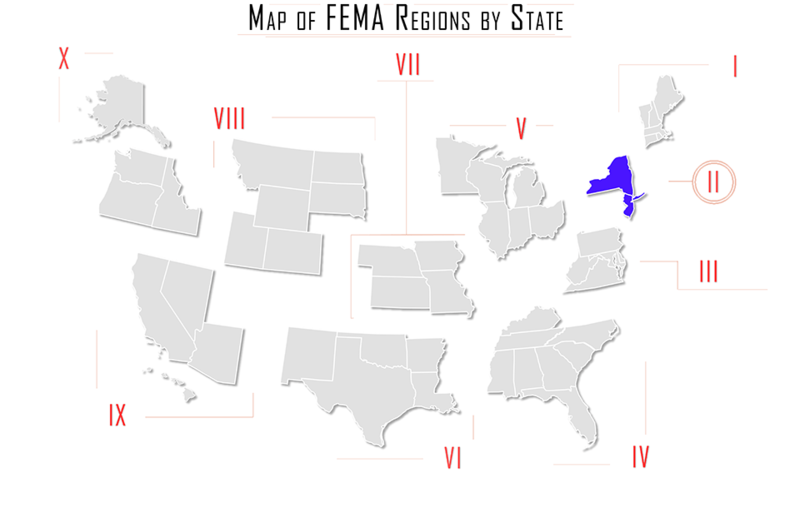 In this issue, At the Region begins by looking at EMS requirements in the FEMA Region II states of New York and New Jersey. Emergency Medical Technician certification levels result from a combination of national requirements and state by state regulations. All EMT training must meet minimum standards provided by the National Highway Traffic Safety Administration (NHTSA); this includes fundamentals in areas such as anatomy, medicine, and trauma. States, however, determine the final designations and requirements. An independent organization, the National Registry of Emergency Medical Technicians, also provides guidelines, and, although these are not mandatory, NREMT exams are used as the basis for certification at one or more levels in 45 states. Because of the variation in training, the NREMT national certification as an EMT does not equate to a license to practice, and transferring local certification depends on state by state reciprocity agreements. All Course Sponsors offering training must be approved by the Bureau; a full list by county and approved level may be found here. Following the completion of training, applicants must pass a practical exam and Bureau written examination at an on-site or regional testing location; the form for scheduling and exam may be found here, and must be faxed or mailed to the location indicated on the form at least eight weeks prior to testing. Testing locations and additional requirements are provided here, and confirmation of testing, along with directions to the test site and a ticket for entry to the exam (provided by the instructor if testing with a class), will be provided at least two weeks prior to the testing date. All testing dates are at 7:00 PM on Thursdays, with a mandatory arrival time no later than 6:30 PM. Payment of $20 is also required, provided at the testing site on the day of the exam. Certification is valid for 37 months, after which recertification through a continuing education process is required. New York has procedures in place for state-certifying out of state applicants at the EMT, AEMT, and paramedic levels. Applicants must be at least 18 years of age, have completed a course that meets or exceeds the National EMS Guidelines, have completed a state recognized practical and written examination within the past 18 months, and hold a current state certification/licensure. New York also grants direct reciprocity for applicants who hold a NREMT certification and have completed their NREMT skills and practical examination within three years of their application date. Reciprocal certification is issued for the time remaining on the applicant’s current certification or license, with a maximum period of 37 months. Applicants may renew their certification after this period by completing a NY state refresher course. To apply for reciprocity, applicants will need to complete the EMT Sheet for Reciprocity, Verification for EMT Certification, and Application Form. Veterans who have completed 68W (Military Occupational Specialty) in the last six years and hold NREMT certification (including completion of the practical and written examinations) will be recertified as an EMT-B for the time remaining on their NREMT card. The New Jersey Office of Emergency Medical Services under the New Jersey Department of Health oversees the EMT certification process. To apply for certification, applicants must complete a training program, be authorized by the training instructor to complete the State EMT certification examination, and pass the exam with a minimum score of 70%. A full list of training sites in the state is located here; to be eligible for an EMT program an applicant must be at least 16 years old at the time of program entry and possess a valid CPR certification at the level of Professional Rescuer or Health Care Provider. Once training has been completed, applicants must complete the State Examination within one year of the date of course completion. Applicants have three opportunities to pass the exam, after which a refresher course is required to retest. Testing dates are located here, and a list of certification and refresher course schedules is provided here. New Jersey State Certification is valid for five years. Once testing has been completed, applicants may submit for Emergency Medical Service Provider Licensing through the New Jersey Health Alert Network. The Network will require the creation of a new account; instructions are provided on the State website. Once the account has been created, a confirmation email will be sent within three to five days; contact Chris Tams at (609) 633 - 7777 once the account has been activated. Confirmed users may log in to access the application and begin filling in their information. Applicants will be notified by NJOEMS if they are required to take a refresher course and complete the Written State Examination. Applicants certified as an EMT in a program meeting National Education Standards, or who are NREMT certified, are not required to take the course and exam; the duration of the NJ certification will depend on the expiration date on the applicant’s current certification/license. The applicant’s current certification/license must remain valid throughout the NJ certification process.